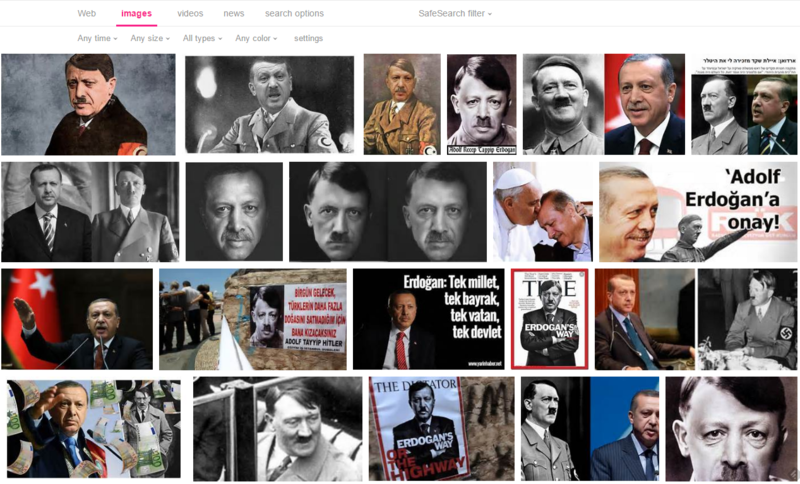 Next thing you know, he'll demand delisting of sites that comment on his name, Recip Adolf Erdogan Hitler! I mean, at $150,000 per URL it would only take 140,000 URLs to eliminate their annual net income. Or alternatively, 600,000 URLs to eat up the entirety of google's yearly revenue. I can guarantee the number of infringing URLs in Google's index is several orders of magnitude higher than that. Heck, I would be very willing to bet the number of new infringing URLs added to google's index every year is orders of magnitude higher than that. So sure, it's Google's fault that they would rather remain in business. I'm sure that google will not comply, since they are evil and do not believe in justice. So if you would list the sites we can be careful not to go to them. If we didnt' know we might accidentally visit them. In fact we can post the list on our own pages to make sure everybody knows where not to go. Is he Hitler or Gollum? Actually, I think it's the ghost of Hitler asking, he doesn't want to get compared to this tin pot dictator! Forget it. I will get you another.. In mother Turkey the Caecar of Rûm gets the people he deserves! But as with all dictatorships, the rest of the world... They hurt. For the likes of Erdogan it is better to become insular and despotic in constant paranoia of foreign and domestic enemies created by nationalistic divisive rhetorics, than facing life after politics! His big idol, Abdul "the great assassin" Hamid II, would be proud. Hitler hates being conpared to this idiot. If it is in response to a US court order then they have no choice. The onus then is on the court. Being compared to Adolf is a step up for this spawn of Satan. Fake nick again. The real My_Name_Here is a fan of authoritarians like Erdogan. Well, Mike states "Not helping these comparisons is Erdogan's similar facial structure and his endless vindictive actions against anyone who's hurt his feelings.". But I don't think this is really evoking a lot of Hitler rather than Erdoğan: Hitler was more into megalomania instead of insecurity regarding his own person and agenda. Admittedly, the consequences are not all that much different. The world's most thin-skinned "leader" is at it again. I don't think that Erdogan has a clear claim to that title. I can think of at least three others who are contenders. History is filled with thin-skinned leaders and arguably many dictators are far worse. It is merely the way he reacts that is so amazingly crazy. While most dictators use the same rhetorics and use same or worse laws, the way Erdogan is approaching turks living abroad is what makes him such a target. The sites are in the PDF at the end of the article. Erdogan has built himself the world's largest presidential palace, a $615 million, 1,150 room monstrosity on 50 acres, and is widely regarded as a megalomaniac. WTF makes you think Erdogan isn't the very definition of megalomania?